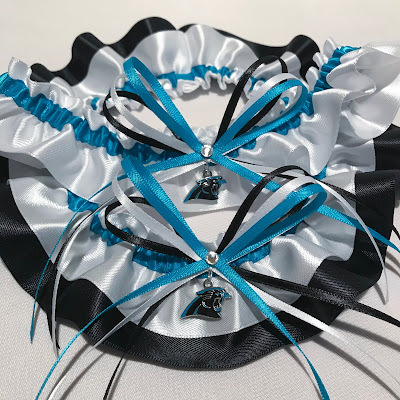 I'll admit I was skeptical when bride Megan requested some customization of her Carolina Panthers garters, but I absolutely LOVE how they turned out!! We switched up the black and white satin, and the Panthers charm just pops against the white! So pretty! Looking for a Carolina Panthers for your upcoming wedding? My selection is available in my shop here. And you can request a customized garter or garter set by filling out the form here!